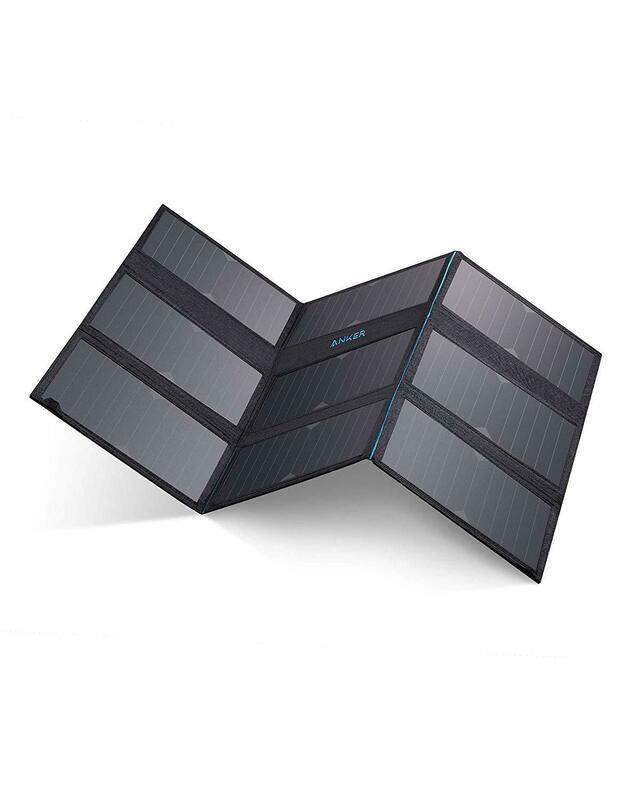 Measuring in at 33.9 * 27.6 * 0.2 in when opened, PowerPort Solar 60 is by far Anker's largest solar charger. There are two DC outputs (8mm @ 16.8V=3A and 5.5mm @ 17.6V=3A), which means this p can power up devices such as PowerHouse! In addition to the DC outputs, there are two USB-A ports, capable of outputting 5V at up to 3A total (2.4A per port). Anker Product Strength: Please try Amazon's No. 1 charge product brand that over 30 million people support. Excellent sun's power: Equipped with state-of-the-art solar panels, it can capture more sunlight than before, and can charge to connected equipment with high output. Convenient portable folding style: It can be folded into a convenient size for carrying, it can also be carried by hand. It can be attached to the backpack. High compatibility: Anker PowerHouse and other devices, from smartphones to tablet devices can be charged to any device. Pricing and Availability: Anker's PowerPort Solar 60 is available to order right now via Amazon JP very soon for a cost of 19,800円, and should begin shipping on October 3. It remains to be seen whether this product will eventually become available outside of Japan, but perhaps @AnkerOfficial has an idea. What are your thoughts on Anker's latest and greatest solar charger? Is this something you would considering ordering? Let us know everything you're thinking by replying! Depending on Cost I would be interested in this if it came here to the states. Well, a direct conversion would suggest $178.32, which seems about right to me. This thing looks awesome I was afraid Anker gave up on solar after the price increase of their last Models. Hopefully it will come to the U.S. I dig it. This is really an interesting item. I think all of us would like to test it. I run solar panels on my roof and have quite some experience about these technique. I have a couple that another company sent me to review and they are nice. But this one I could see a good option for camping and off grid multi-day hiking. Very nice. My stepdaughter n her wife n child would find this amazing when they go camping. Would it be/is it, waterproof? Wow, that solar panel is huge! This guy does a water and crush test and even tosses it in a fire pit and I have to say I was very impressed with the original Anker Solar panel durability I would imagine the new solar panel is on par with that level of durability. It's hard to tell from the product photo, but it seems that it's a HUGE panel - I'm assuming it will be like three PowerPort Solar 21 side-by-side, which is also indicated by the name. And with both DC and USB outputs, we are talking serious camping equipment here. If I were to go on a long group camping trip, I would totally consider this. Just one would be enough to keep a 5 to 6-person group properly powered through an easy rotation. So, if I ever find another 4 to 5 people to go camping with me, and I'm in Japan, I'll get one! Too big for me, I use 21W and carry the weight of it. Also what keeps it flat square to the sun? I unfold 21W and prop it against bag, what stops this big a panel folding? Advantage of bigger is it's more likely to work in any daylight situation even inside the tent if it's raining. I'd say 21W per person to keep a phone working and a few smaller items like flashlight, BT buds. So this would serve 3 people easily. I actually have that little Goal Zero and to be perfectly honest I haven't found it particularly practical. I'd be willing to trade on the size for larger capacity I think. and I'm in Japan, I'll get one!